The poll will show possible plant names here, when enough are collected. so get thinking and go to page 5! Mind: Highly intelligent, mostly creative and peacefull. Currently in a very advanced state. They also have the added bonus of being able to inherit alot of information from their parents. This meens than a single Corvala can potentially remember 12 or more generations back - with the downside being that they only remember up to their birth, and nothing is crystal clear. This also meens that creating records is sometimes unpopular. Strength: Varies depending on location, usually very strong legs, arms usually strong yet seem to be weaker with newer generations. Defence: Weak scutes cover body, with larger and stronger plates along the back, creating a spiney ridge. Skull and ribs are extreemly thick due to many accidents during early hunts. Although they are covered in armour they are still soft to the touch, although given the right diet and conditions the scutes can be made extreemly tough. Colour: Again, this varies on location, especially between planets and genetic engineering, but on average the skin tone is a crystal or water blue, often setting them apart from their surroundings quite drasticly. 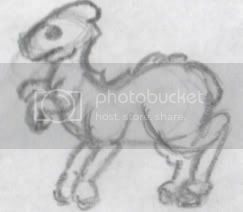 Comunication: Much like Parasaurolophus, their nasal passage extends up the ridge on the top of their head, allowing them to make loud trumpet sounds over long distances (as well as snorkel effectivly). Due to the make up of the bones and tissues in this horn, the sound produced is very much unlike any instrument on earth, and the sounds is said to be haunting. They also have a voicebox and tounge like humans, although theese are slightly less developed than our own, only allowing for what would be seen as basic human speach, but the tounges are rigged in a way that allows a stream of constant, fast and strong clicks when needed. Diet: Omnivore. When more primitive than today they ate mostly meat, now mostly plants and synthetics. Lifespan: Naturally the lifespan of a Corvala is very short. This did however allow for a very speedy evolution, and ment that their minds and bodies were shaped very early on in the universe's timeline. Since they have reached higher states of intelligence, they have found ways to increase their lifespan several fold by increasing the time between birth and maturity, then after maturity they may use several products and technologies to stay alive, although they still have a greater life span in general after maturity than ever before. Currently they are at an expected lifespan of 200 earth years, however this effectivly meens that they are still very much pre-pubecent untill about 150 years. Being one of the few creatures that get pleasure from procreation, this makes the last 50 years fly by. Mythology: The Corvala's own religion is devided amongst many seperate cultures, much like christianity on earth, but their overall attitude is much the same. They have also bought many species to sapiance, allows them to create tribes and cities, and have often medeld in lesser races' evolution. In some cultures, cirtain family lines of Corvala may return to the same planet several times and become worshiped as a god/as gods. 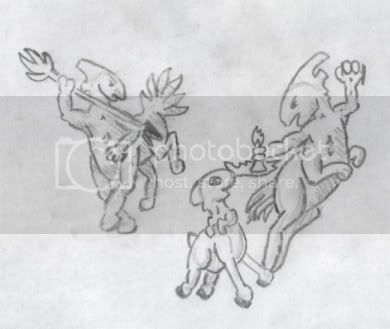 It is also belived they may have some connection to either the centaur or unicorn myths of earth. It is not unusual for 2 seperate lines of corvala to visit the same planet several hundered years apart without realising, and as such several planets are down multiple times in the record books, often with drasitcly different discriptions. Not gonna put much info in right now, but will expand soon. Basicly, their a space traveling race, they were warlike but are now far more peacefull. They raise and sometimes raze civilisations for fun, and to be seen as gods. The tails at the back, there are 6 of them, their size can vary dramaticly between individuals. The hands look big because I tried to put detail in them, but they are slightly smaller than pictured. 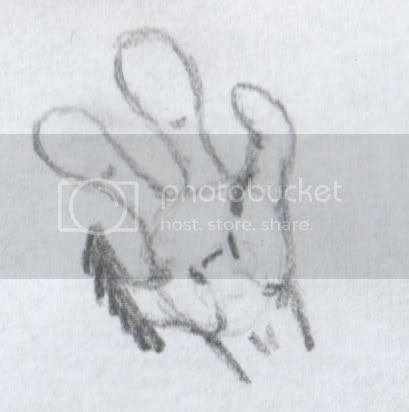 The little finger on the hand has a razed edge, and is an amasingly good weapon and tool, meening the development of other tools and weapons didn't come until quite late in tribal phase compared to most other creatures. It may look like an upside-down pick-axe, but is infact shown roughly corresponding to the hand above (although the little finger is wrapped under the item when in use. 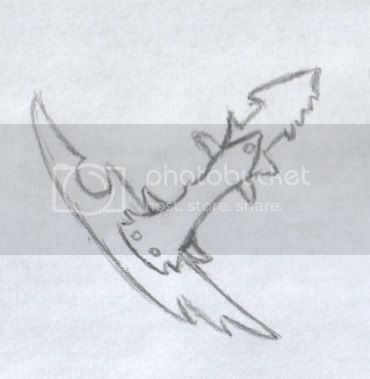 This dagger item (I have no name yet) has 3 main attacks, 2 of which are based off the the little finger - a slice back and down (cuts) and a stab forwards (impale, with extra damage when pulled out). To aid this, there are miniscule but very sharp edges along the rim, invisible to poorer sighted creatures. The 3rd attack is a stab upwards, which is far more powerfull than a thrust, and is usefull for taking out the taller creatures on the planet, and defeted corvalas. It too is razed on one side, but this is more for mutilating than slicing. Reminds me of the hands on those humanoids in the book "Man After Man"
This creature is original and nice (and has 4 digit hands increasing it's awesomeness value). And I like the bit down the back. 8 thumbs up! Now, more drawings! Join the AoH! We will give gifts of mountains of oats and hay! You're centaurs will never go hungry if you join! awesome creature design...totally love it! 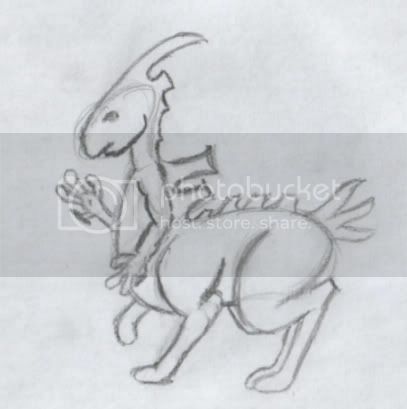 Comunication: Much like Parasaurolophus, their nasal passage extends up the ridge on the top of their head, allowing them to make loud trumpet sounds over long distances (as well as snorkel effectivly). Due to the make up of the bones and tissues in this horn, the sound produced is very much unlike any instrument on earth, and the sounds is said to be haunting. 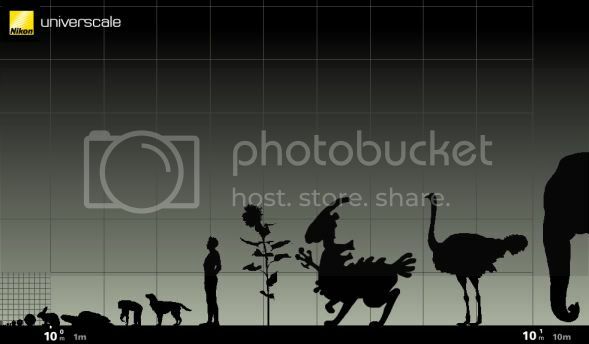 woohoo, finally another creature with a parasaurolophus-crest/nose! 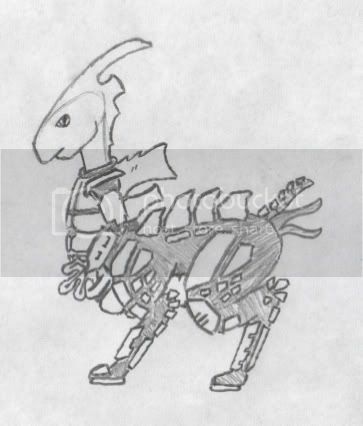 I want to have a go at RPing with spore creatures, my last try didn't work to well... Do I just start a topic or? The closest relative to the corvala which isn't a different 'breed' of corvala - much in the same way monkies are close to us. In terms of creature they most represent in our culture is the pig. Mind: Poor inteligence. Unaggressive, but very loyal. Strength: Weak. Also unable to pick anything up with anything but their mouth. Defence: Much like the corvala, they have a light covering of armour. Their feet have evolved into the equivilent of a horses hoof, but using the 'scales' rather than nails. Comunication: They also have a crest, but it is far smaller and less refined, so sounds more like a whine. They can also click, but not as fast as even a human. Like rabits, they stomp their back legs if they see/hear danger, since their call is not able to travel too far. Corvallos were one of the favorite creatures to hunt for covalos during early stages, but since they have realised they are closely related, the hunting and eating has stopped. 2 Corvalas hunting a large Corvallo. Some families like to leave corvallos on the planets they enhance, to confuse the later generations of inhabitants into beliving these creatures is what their religion is based on. The Corvala often use them to gauge when to go back - when the scientists have discoverd that the corvallo don't share (all of) the same DNA as anythign on their planet, the corvala have fun watching them ponder then head back for a second coming. This is one of the creatures I am truly interested in, they're real nice. Please, do not get involved or the war or politics, you will lose me as a fan if you do. And looking for RP you say? If you are interested the Omic will be glad to meet you! Ah ok. I scanned this to show ya what i ment since i could not find a picture on the net. They are post humans that evolved into grass eating herbivore who pull the grass up with their hands and use the edge nail as a cutting tool. Cool creature, and nice body layout. @Hydro: That is just plain creepy. Of course, some are bigger, some are smaller. The one pictured is about 100yo (mid life) so still has some growing to do. As for the omic, how would I satrt a rp thing? 1. Start it in your thread. I definetly do not recommend this! It loses you plenty of readers. 2. Start it in my thread (or whoever the RP is directed to), however, for reasons above, I would refuse. 3. The best reason, give it it's own thread. Armour, civilisation's evolution and their planets resorces. Anyone mind posting so I may update? This is, as of yet, incomplete, but gives you a good idea. Corvalas didn't follow the same path towards their modern state as most creatures did. Having hunting, gathering and survival tools built in allowed them to bi-pas the stone age. Fire age: Their evolution happened mostly through an ice age, leading to their snowy appearance and thick skin. They lived deep in caves where they could conserve heat and, studying the effects of lighting on the plants outside, soon adopted fire as their main tool. Not only did it allow them to stay warm and see where they were clearer in the dark caves and darker nights, but it was also very effective against the creatures which were developing hair, and they would often throw sharpend sticks with intact hair set alight on the end as weapons. Copper age: One of the main metals found on the planet (along with Silver and Iron) and the most readaly available of them, this was the first physical cutting tool used by the majority of the population (a stone tool has been found, in the rough shape of a corvala nail, and is belived to be an aid as the owner was born without the 4th fingers). It's use for cutting was probably accidental, since the first known use was for simple shaped bowls. The tool later developed into the weapon shown above and into a digging tool. It's use was simplified by the corvala's ability to pass on such skills from generation to generation. Silver age: 'Silver' is slightly misleading, as the closest equivilent on earth is Osmiridium. However silver was one of it's main components. The softer ground of the planet combined with the fact that large streams were now forming and eroding rather deep down from the surface ment that the discovery of the metal was rather swift. again, at first it was not used for tools but was mostly decorative and for armour. The tough nature of Osmiridium lent itself to the tasks copper could not live up to. Many other cultures find the eccessive use of silver, even now, to show the power and elegance of the race. Fitting armour for such an odd shape is never easy, and several types have been used. This style was first used for the corvala equivilent of gladiators, with the darker areas being mostly chain mail. This allowed the competitors to run easily and quickly, whilst also protecting the front and underside, which are both the most vunerable areas and the parts you most see in fighting. The style was brought back many decades later for war on other planets. The suit was said to be intimidating. Of course, the new suits are far stronger and safer. Nanotechnology runs through the tight fitting under suit (dark areas) which allows for bullet proof...nes and can resusitate the wearer automaticly. The armour parts (lighter) are a composite of synthetic material and an overlay of shined Osmiridium. The suits look amasingly bright in combat and lent to a stratergy of attacking towards the sun, blinding the opponant. Recently translated literature talks of a pool of light over the horison, from which imerged god-like beings. Since the invention of force-feild technology on the spaceships, a similar technology is implimented in the suits. Due to the high power needed, the force-feild can only be used for short times, and only covers the front (eminating from the arms). At full power, and with quick reactions, a corvala can withstand the blast of a large bomb from a few feet away. This is a generic distress call from a corvala. You might make out the wind rushing from the mouth and nasel passage into the crest, and the closing of the crest as the sound comes to a close. The normal call of a corvala is lower and less stressed, and often acompanied by clicking. According to legend, several thousand corvala made a similar call as they prepared to attack a large civilisation on their home planet (think troy), and the resulting chorus echoed around the globe.